"Fully licensed" means that they can serve alcohol, which just cracked me up- particularly in combination with the "open 24 hours". Because who wouldn't want pancakes and cocktails at 2 a.m.? Hey, that's my hometown! Pancakes at 4am are awesome, especially when nothing else is open and you're hanging around waiting for public transport to start running again after a night out. Plus, it's a very cool building and they used to have a giant chess set in the middle of the floor. @Lucy, we had a great time in Brisbane when we visited! There are certainly places here where you could get pancakes at 4 a.m., and some of them also serve alcohol. It was the advertising that amused me. Most people here go for the grease (i.e., eggs, hash browns and bacon or a cheeseburger and fries) for the late night post-partying snack. 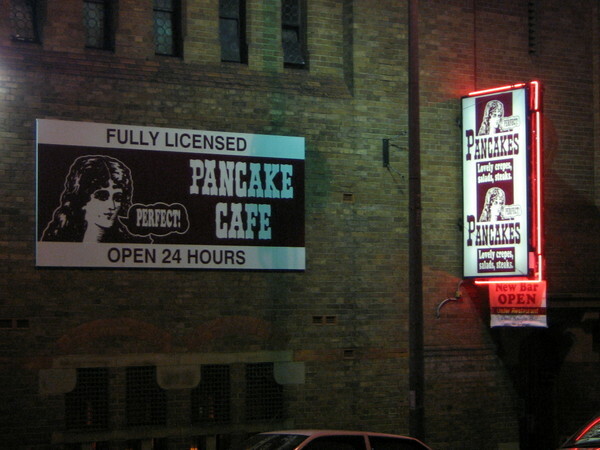 We have a couple of these "Pancake Parlours" in Melbourne too. I have fond memories of going to these late at night, after "School Formals" (a bit like Prom). Mostly because they were open late - not so much because of the Alcohol. I could be wrong, (some fellow Aussies may disagree) but I think it is pretty rare here to have a cooked breakfast of pancakes, unless it is a special occasion. Pancakes are not as connected to breakfast I guess, they are an anytime of the day food. I think this chain was actually introduced to Australia by some Canadians. I'm lovin that 70's looking dude saying "Perfect!" at the prospect of pancakes and cocktails. haha! OK, I feel I should clarify. I wasn't really making fun of the fact that this place exists. I was just amused by it- because that is not how pancake houses in the US advertise themselves.